I have had some really great issues lately for This Old Dragon. Issues I remember fondly or issues that had a huge impact on my games and/or game writing. This is not one of those issues. Oh, don't get me wrong, Issue #141 is fine, but there isn't anything in it I remember using. So it is next in my box of mildewy memories, so let's head back to the beginning of the end of the 80s, January 1989 to be exact, for This Old Dragon! Ok, so I remember the cover even if my magazine doesn't have one. I think that might be all I remember of this one. 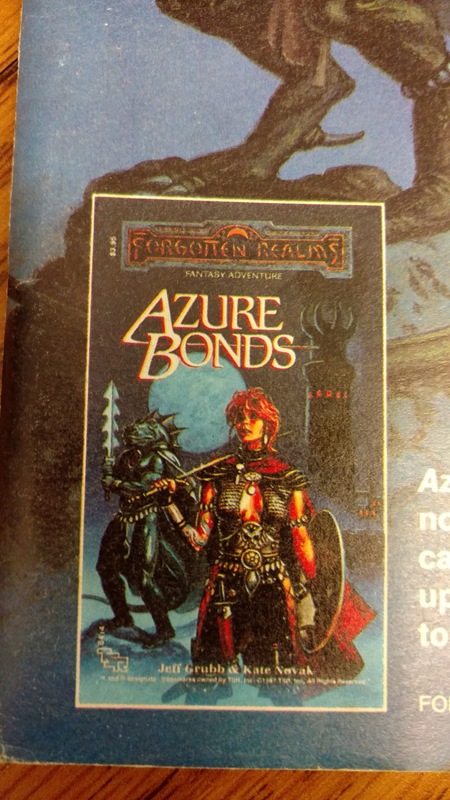 A few pages in, or the first page of my copy, we get an ad for Curse of the Azure Bonds. It seemed like to me that this book was advertised ALL the time. We get the great Clyde Caldwell art, but the add is different than the book cover. I have to admit that, for reasons I can wholly articulate, it bugged me. Yes...yes I know that covers are mocked up all the time and this is no different. I even know now some of the issues going on behind the scenes of TSR at this time. So my feelings here are more of a memory of feeling and not the feeling itself. Plus in either version, that sword the Lizardman has is stupid looking. Plus I still have never read this book. Maybe I should. Might exorcise the ghost of this feeling. Another ad. This time TSR trying to get into the party-game market. One of the hotter games at this time was Scruples. It was pretty popular and due to a combination of this game and drinking it was banned from our circle of friends back when we all lived in the dorms. This is not that game and I can see why it failed. Scruples was simple, much like how Cards Against Humanity is, and there is a lot of social interaction. This game "I Think You Think I Think" looks so over designed. It might work well in today's board game market, but I somehow doubt it. The name is also too cumbersome. Forum covers some debate on Illusionists and their spells. About a dozen pages in we get to the main feature of the magazine, near-human like creatures. 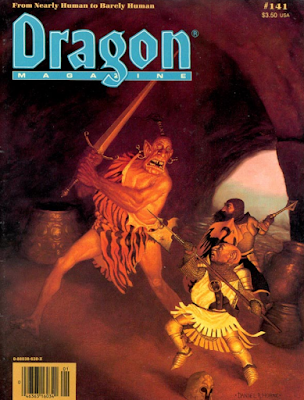 The cover features a Jeff Easley ogre or giant squaring off against a little blonde magic-user. 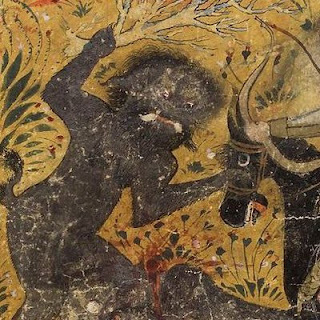 The Dragon's Bestiary features all sort of humanoid creatures. Most with names we have since seen elsewhere. Randal Doering provides us with something new in Orcs Throw Spells, Too! or humanoid spellcasters. This is for the AD&D 1st Edition game. The article is good and has a lot of meat, but it also is a good example of the schizophrenia that was rampant in the late 80s and early 90s TSR design. Yes this is great stuff, but the BECMI rules covered this material. Granted, we would not get the Rules Cyclopedia for another couple of years. Spell casters among these races are considered to be more "primitive" (why? just because) so they get Shamans and Witch-Doctors or Clerics and Magic-Users respectively. Personally, I like to think of Shamans as a different sort of magical tradition altogether. I like to see my friend +Rich Howard get his Shaman book live, I think there is a lot of potential for such a class. Me, I just cheat and make humanoids into a type of witch or warlock. Arthur Collins is next with an article on giants and combat techniques in Boulder-Throwers and Humanoid Hordes. This would have been good to read when I started running the Giants series. Now we have something useful for today. In Hey, Wanna Be a Kobold from Joseph Clay we get rules for humanoid PCs such as Orcs, Goblins, Kobolds and Xvarts. This also includes Shaman and Witch Doctor class write-ups. Re-re-reading this again I am struck with the question of why didn't we do this sort of thing more back then? I know we were still a decade away from Meepo, but this could have worked well in many games. Jumping over the fiction we get another timely feeling article. Reviews of MegaTraveller and GURPS Space. With Starfinder on the horizon, this is a good time to go back and look at what had come before. Big four-page, full-color Warhammer 4k ad from Games Workshop. The TSR Previews is dominated with Dragonlance and Forgotten Realms. The Role of Books covers a bunch of new fantasy books. At this time I had moved deep into horror and was just discovering Clark Ashton Smith. So I don't really recognize these books. 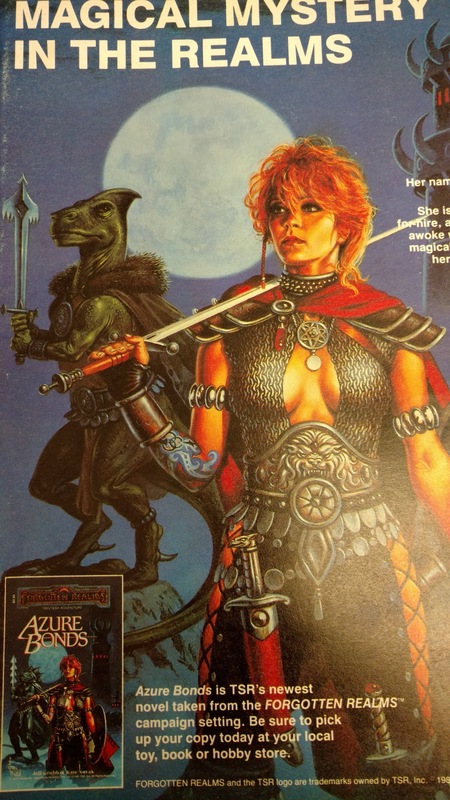 Following up on that The Game Wizards details a bunch of novels coming out of TSR. 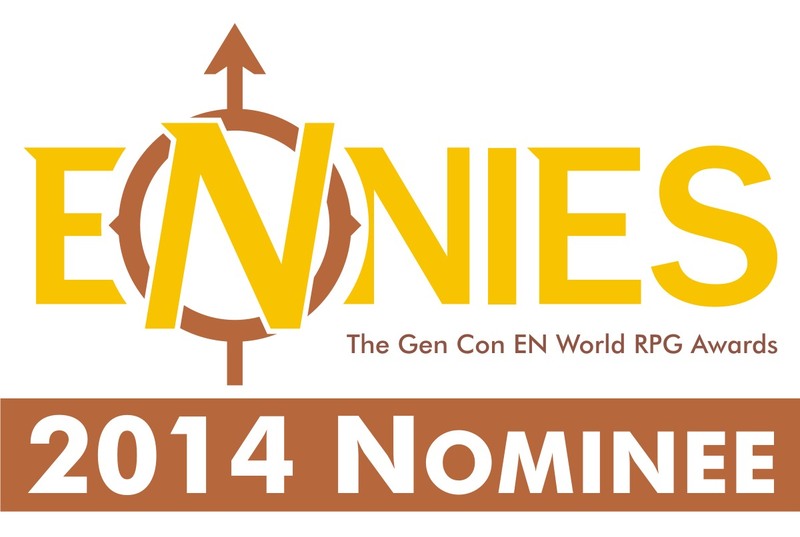 Dragonlance, Forgotten Realms and Buck Rodgers take the center stage. The Role of Computers features a bunch of games. That's obvious, but my take-away here is not what games they are reviewing but the systems the games are on. There are still a wide variety of computers the games are available on, but that number is going down. Eventually, there will be only two, IBM/PC-Compatible and Mac. Lots of ads in the back. The only comics my copy has is Snarf Quest. 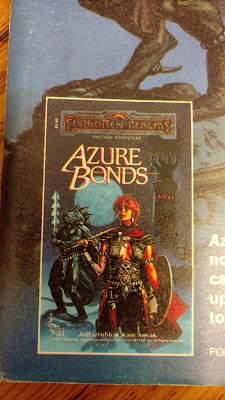 I checked my CD-Rom and I am missing the big announcement on the back cover of AD&D 2nd ed coming next month. Ok. So not a great issue. Not a horrible one, but not a lot I can use today. I am really enjoying this series, wish I'd thought of it myself. I remember the cover and the charts. Sadly we only put together a small game and play it by myself (several times to see what variances occur)... 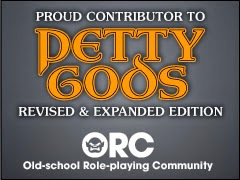 But we do enjoy reading your posts (as well as D&D posts at other blogs)... wishing you and yours a pleasant weekend. I find this this review incredibly sad for some reason. I was not buying/reading Dragon at the time this was published. Yeah. I get that. I was a sophomore in college so I was not buying them all at this time either. I played it on my Commodore 64. Great game!